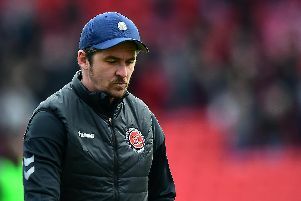 Fleetwood Town boss Joey Barton is sticking to his word by giving youth a chance as they headed to Hungary on Sunday. Town flew out for the next stage of their pre-season preparations after wins in their opening friendlies against Southport and Salford City. Having spoken of his duty to provide opportunities for young English footballers, Barton has taken seven of Town’s development squad abroad with Billy Crellin, Matty Urwin, Nathan Sheron, Harrison Holgate, Lewis Baines, Ged Garner and Ashley Nadesan all travelling. All have featured in the first two matches with Barton keen to follow the example set by John Sheridan last season in giving younger players an opportunity. He said: “We have got a good academy at Fleetwood and we want to get pathways. “We saw young Ged Garner in there and Biggins got on the scoresheet. Barton is excited to see more of his youngsters in action this week as they prepare for two games in Hungary. He had been trying to figure out where to play 20-year-old centre-half Sheron, having played him in a back four alongside Cian Bolger against Southport. Sheron was utilised in a number four role at Salford and impressed Barton, who also said striker Nadesan did his cause no harm by finding the net. Barton said: “From our perspective, everybody got through the game, everyone got minutes and we have had a 17 and 18-year-old sitting on the bench for experience. He was also impressed by the attitudes of Ash Hunter and Wes Burns, both of whom were left out of the starting line-up as Conor McAleny, Paddy Madden and Bobby Grant were the starting front three. McAleny made it two in two in joining Madden, Nadesan and Biggins on the scoresheet. Barton added: “Ash Hunter came on and showed what he is about, Wes Burns came on. One other name in the travelling party is triallist James Wallace, who gets another week to impress, though Toumani Diagouraga has been left at home and can leave the club.